Pat McGrath is one of the industry's most influential makeup artists. She has painted almost every famous face in Hollywood and worked backstage at fashion's most celebrated shows. Her genius is palpable, and her demeanor is just as cool as her art direction. So when McGrath launched her first-ever beauty product, Gold 001, the world took notice. And the super-pigmented metallic shadow sold out within minutes. Lighting struck twice when she dropped Phantom 002, a collection of club kid–inspired reflective shades made to break with convention. Again, it flew off the proverbial shelves in mere seconds. So when that signature bag brimming with sequins came across my desk, I was immediately flustered. As a beauty editor, the feelings that come with trying a Pat McGrath product for the first time are akin to ripping open presents on Christmas morning. The kit comes with an incandescent gel pigment, buffer brush, and the dual-ended Shiny Stick, which has a highlighter on one end and a beauty balm on the other. First I applied the highlighter right above my cheekbones and buffed on the Iridescent Pink 003 pigment on top. Instantly I had that ever-elusive ethereal glow. I turned to the side to admire my work and couldn't believe the subtle yet totally rad holographic sheen atop my cheeks. I went a little crazy and applied the concoction to my eyelids and lips, following soon after with my brow bones and in the corners of my eyes. Sure, I went a bit overboard, but I looked really luminous. By the end of it, I was smiling from ear to ear and felt like Gigi Hadid on her glowiest day. So when that signature bag brimming with sequins came across my desk, I was immediately flustered. As a beauty editor, the feelings that come with trying a Pat McGrath product for the first time are akin to ripping open presents on Christmas morning. 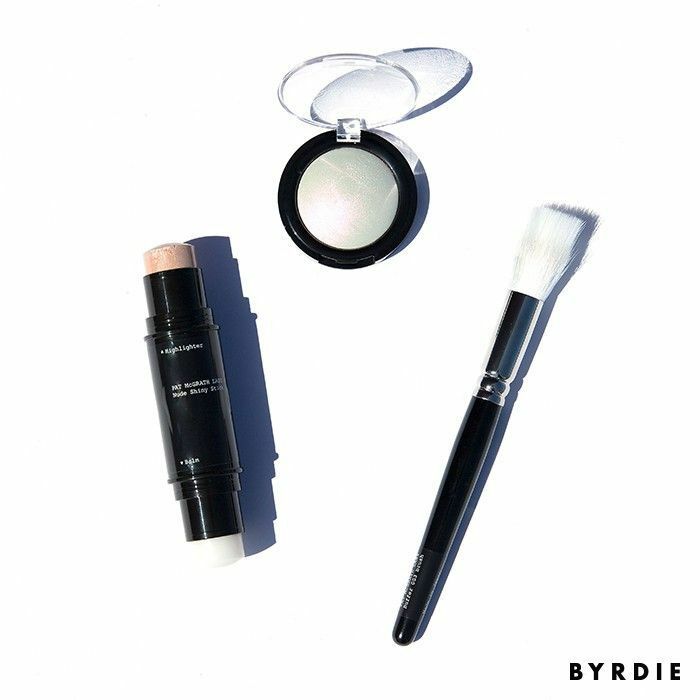 The kit comes with an incandescent gel pigment, buffer brush, and the dual-ended Shiny Stick, which has a highlighter on one end and a beauty balm on the other. First I applied the highlighter right above my cheekbones and buffed on the Iridescent Pink 003 pigment on top. Instantly I had that ever-elusive ethereal glow. I turned to the side to admire my work and couldn't believe the subtle yet totally rad holographic sheen atop my cheeks. I went a little crazy and applied the concoction to my eyelids and lips, following soon after with my brow bones and in the corners of my eyes. Sure, I went a bit overboard, but I looked really luminous. By the end of it, I was smiling from ear to ear and felt like Gigi Hadid on her glowiest day.